Are you worried about a leaky basement? Are you seeing signs of flooding or is that WET season coming up soon?! If so, you may want to ask yourself "When was the last time we had the basement waterproofed?" More than ever we are seeing people with flooding and basement emergencies caused by a lack of proper maintenance and failure to waterproof and treat failing basement foundations and walls. At M&S Mudjacking we specialize in basement waterproofing and basement flood prevention. 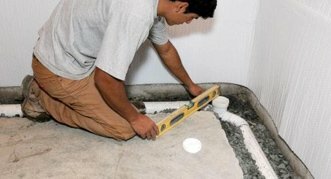 Basement waterproofing is a process that requires skill and experience in not only working with sealants but with foundations and various types of cements. M&S Mudjacking's top of the line Basement Waterproofing service will put your mind at ease and allow you to rest assured (and dry!) 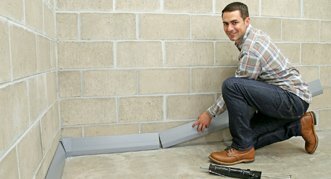 that your basement walls will be leak free to years to be! Any moisture in your home is the potential for harmful molds as well as damage to your property. Have you assessed your basement and noticed signs of water? Do you live in an area prone to flooding? Waterproofing your basement may be a solution you need to investigate! Water in the basement can come from a variety of scenarios. Living in the Midwest alone can be a culprit. The winter freeze and spring thaw cause soil shifting that may effect the integrity of your foundation. Water can enter through even a hairline crack. Many local homes are also situated in the river valleys and a high water table is often present. This alone can make a waterproofing system a necessity in your home, redirecting the water when moisture levels are high and preventing it from finding it’s way into your home. Have you considered the cost and mess of a flooded basement? Let the experts at M&S Mudjacking Inc. evaluate your home and advise on the best methods to keep your home dry and comfortable! Our skilled technicians can keep your home leak free and put your mind at ease!